Any occasion will be more interesting if you consider and prepare in advance. And for that you need to write the script of the holiday. It needs to be fun, fun. After all, its main task is to create a good mood, to make the holiday unforgettable. Start with invitations. After all, no guests, no celebration will be. They should match the theme of the holiday. It is better to make your own. Take a sheet of paper, fold it in half and cut out a figure depending on the holiday, clown, snowman, flower. On the side a little dorita. Paint. Expand, write inside the text of the invitation, specifying the place and time of celebration. You can use poems:waiting for You with impatience,Counting the minutes,Riddles, surprises,Funny jokes.Invitations give into the hands of the guests. Now select the form scenario. It can be a journey, with Chingachgook on the prairies. Or - searching for treasure. Refer to more modern genres and make the script in a concert "Become a star". Interesting scenarios are composed of one or more tales connected with any characters or plot. Determine which characters are in your scenario and who will play their role. 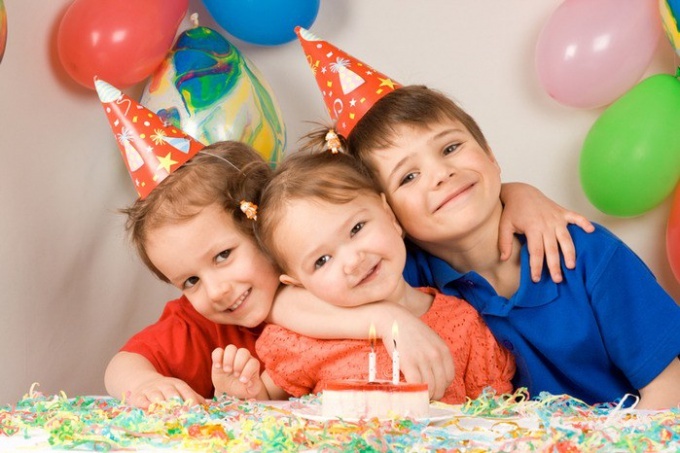 If the holiday for small children, it is necessary to negotiate with older children or adults.Select a host that could control the course of the holiday. Kids are unpredictable, and entertainer during a scenario to solve all the problems. The script must include games. After all, any child realizes himself in the game. Try to pick them up in keeping with the theme of the script. To do this, take any game and make up her story. It might look like.Masha and the Bear gone fishing. And the fish in the pond, visible-invisible. Scatter cut-out paper fish. One of them will catch? Tie the eyes of the players. For fun you can pick up the costume elements. Masha - kerchief, Bear ears or hat. The script must be written in accordance with the age and character of the hotel. It may happen that on the day of birth to the boy only came the boys and the girls - girls. in this case you need the script to prepare the corresponding. Arrange the boys "men" of the test. The game is called "Best fighter".The first contest "Best trooper". You need to "ride" the horse - ball. The winner is the running to the finish line without losing the horse.The second contest "the Best sniper". To throw a grenade - bump into an enemy bunker - bucket. You can give three attempts. Declared the most accurate igrostroy the competition "the Best driver of the tank". Tied to a toy car rope. For her to hold the machine so that it is not overturned.The fourth contest "the Best scout". Through the obstacles necessary to get to the rear of the language of the ball and back.A list of competitions can be continued at your discretion. Be sure to think about the prizes. It can be homemade medals, certificates and diplomas. Prepare the medals and coins of chocolate. If funds allow, buy the children toys. Importantly, all of the children at the party were given attention. Be sure to include in the script the dance. The disco will be happy not only teenagers, but kids. Kids dance themselves, show them movement, praise. But teenagers it is better to leave, let them fulfill their potential in dance. At this age, the presence of adults usually binds. Depending on the script, prepare costumes.